Story time at Chez Angel – Go! Go! Go! When growing up, I remember I adored books that had flaps. It was always exciting to go inside and explore all of the hidden wonders. My oldest son, NHL loves reading flap books as well. He is now able to explore them without damaging the books. Recently, NHL and I read the book Go! Go! Go! by Roxie Munro. Right on the cover of the book, it states that there are "More than 70 flaps to uncover and discover!" Each and every page in this book is loaded with flaps and items to unwind and flip that help and tell the story. NHL and I waited for a quiet time and stretched out on the floor to explore the book. As soon as we opened the book, NHL noticed that the information on the inside cover was even included in a flap. We immediately knew that this was going to be a fun experience. As you continue into the book, you are taken on a transportation adventure. Roxie Munro’s colorful illustrations, and interactive flaps quickly brought us into the world that she created. Our first stop was a fire station where firefighters were getting ready. NHL liked lifting a flap to help some of them slide down the pole. Another flap made one of the people in the scene pick up a telephone. This allowed NHL and I to talk about things that go on in a fire house. He had a great time using his 5 year old imagination and playing out the scene sine there is no text on the page. As we continued on, the book a huge flap that allowed the fire truck to drive down the street, send out the ladder and put out a fire. NHL was in his glory because this one page required you to flip a section four times. Next, Munro takes us to a Balloon Festival. Here you lift flaps to assist the people taking items out of their trucks and getting the balloons off the ground. Then you go to another page and the balloons all lift into the sky in a gorgeous display of artistic perspective. Go! Go! Go! continues taking you to a horse race where you watch the horses getting ready and then they are off and racing. Next, there is a Deep-Sea Discovery Research Vessel that shows a diver exploring the ocean below. The last stop is a Pit Stop where members are assisting two cars in a race. The last page of the book opens up to reveal an amazing display of a raceway that is as wide as four pages. While exploring here you are able to make the cars race around the track. NHL and I enjoyed this book. It was a great way for us to talk about different items that are on the "go" and discuss things that take place in these environments. Roxie Munro does an amazing job of capturing the details and allowing the reader to truly feel like they are in the scene while flipping and turning the flaps. 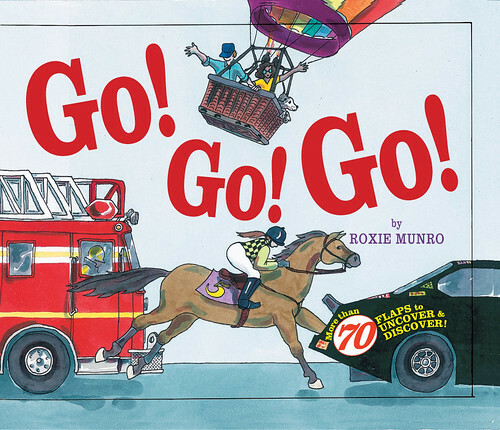 I know that we will definitely be exploring more of the wonderful books by Roxie Munro in the future.